A broken foot is one of the fastest ways to interrupt your work, hobbies, and life in general. It’s hard to be active or even to get around when you’re on crutches! It makes sense, then, that no one wants to be stuck on crutches for any longer than they have to be. You can’t really rush your bones, though. There’s a process to your recovery, and many factors can affect it. You begin your recovery the moment your fracture is diagnosed. An X-ray or other diagnostic image will determine exactly where and how serious the damage is to your foot or ankle. This is important—it helps identify what your limb needs to heal. This could mean re-aligning the broken ends of bones or even performing surgery to pin the pieces back together. The fractured ends must be aligned to heal correctly. Otherwise you could end up with an odd bump or other deformity, and be more susceptible to fractures in the future. When the ends are aligned, the bone tissue begins to “knit” back together. Fresh tissue fills in the cracks between the ends, then slowly solidifies and hardens. During this time, the bone has to be kept immobilized. This is, of course, why you have to wear a special cast or boot and use crutches to help you walk. A variety of factors affect how quickly your fractured bone will heal. Younger children tend to repair the same kinds of fractures much more quickly than teens or adults. Your overall health and normal activity levels can affect this, too. Your bones need nutrients, vitamins, and good circulation. Also, the more extensive the damage is, the longer any healing will take. In the end, you can expect to be in a cast for anywhere from just a few weeks to a couple months. Broken bones are serious no matter where they are, and need immediate care. The more care you give to them in the early stages, the better it is for your recovery. 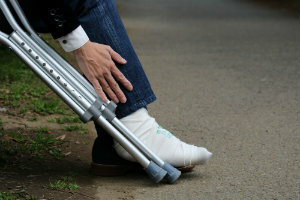 Let our experts at Absolute Foot Care Specialists help you heal as quickly as possible, so you don’t have to spend more time on crutches than you need. Contact our Las Vegas offices today if you’re at all concerned about the bones in your lower limbs. You can call (702) 839-2010 or use the online request forms to connect with us.